"Every St. Patrick's Day when we were growing up, my grandmother would have us over to make Blarney Stones, pound cake cubes dipped in frosting and rolled in dry roasted peanuts. This became a tradition we considered part of our Irish family heritage." Pour confectioners' sugar in a bowl. Gradually add milk, whisking constantly, until mixture has a thin frosting consistency; whisk in vanilla extract. Place chopped peanuts in a bowl. Line a flat surface or a plate with waxed paper. Dip 1 pound cake cube in frosting and roll cube in peanuts; place on wax paper to dry. Repeat with remaining pound cake pieces. 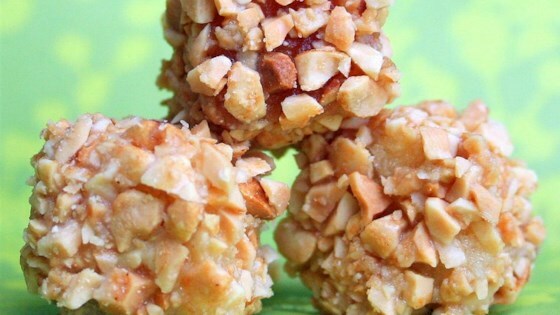 Cubes of pound cake are dipped in frosting and rolled in dry-roasted peanuts. Wasn’t that pleased as the powered sugar didn’t harden up like I thought. Also I used crushed pecans instead of peanuts - however they would not stick. Loved them, and they were fun to make. Simple to make. Went over great at the Saint Patrick's day potluck.